Today I am so excited to be joining the most amazing group of bloggers for the Styled + Set Blog Tour: Valentine’s Day Entertaining! This wonderful tour is hosted by Lory of Designthusiasm (thank you Lory!) 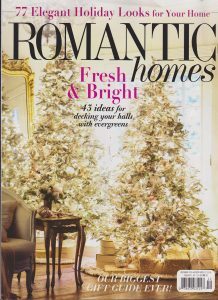 and features 30 bloggers sharing decorating ideas and inspiration for Valentine’s Day. There will be 6 bloggers a day, for 5 days, so check back during the week to see all the inspiration! 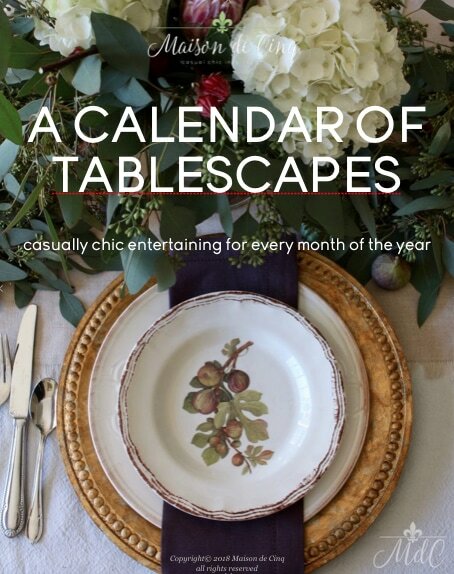 And for even more inspiration, check out my free e-book featuring twelve of my favorite tablescapes! 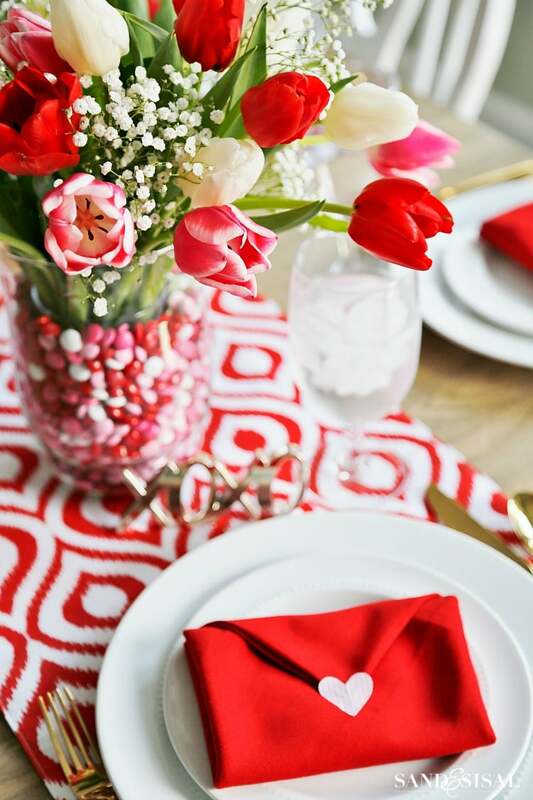 Today I’m sharing a simple Valentine’s themed tablescape. 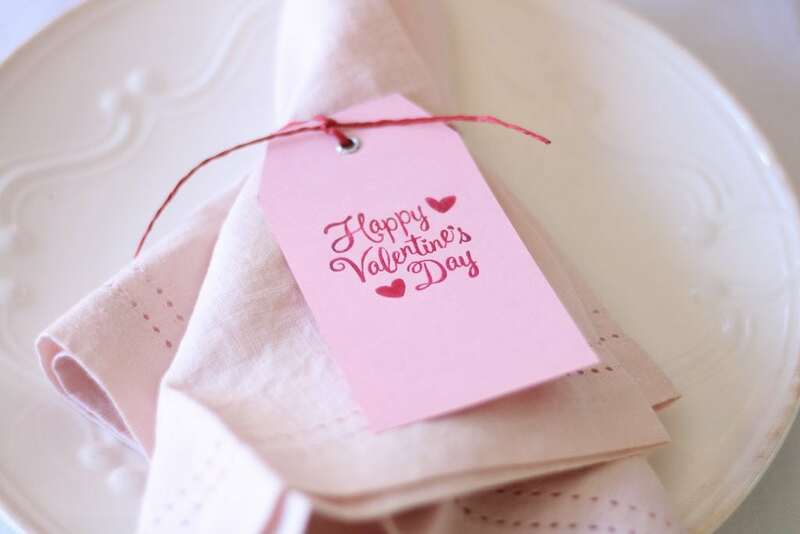 I don’t know about any of you, but my husband and I have rarely gone out to dinner on Valentine’s Day. It’s crowded, and over-priced, and usually he’s working a regular day so it just isn’t realistic for us. 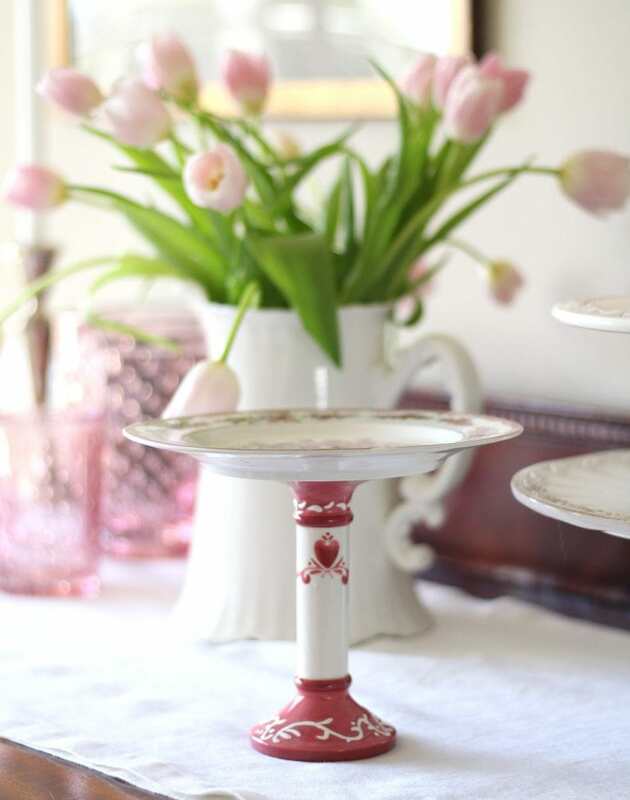 But since I love to set a pretty table, we often try to have a romantic dinner at home. But this year, I thought it would be fun to do a table that is set for a sweet little dinner party. This would be perfect for four people, or it could work for just one couple as well. Either way, you can eat good food, not feel rushed, and linger over wine and conversation as long as you want since no one else is waiting for your table! 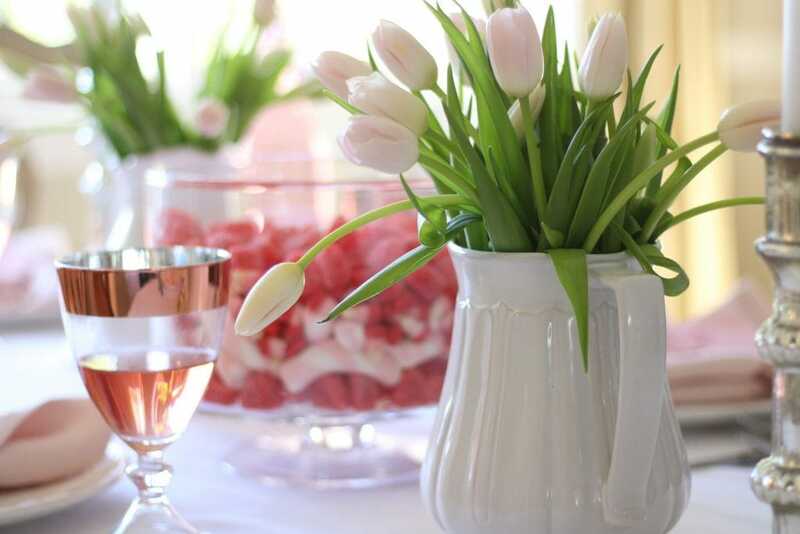 Last week I happened upon these gorgeous very pale pink tulips, and that is what set the tone for my table. I wanted it to be subtle pinks, with very little red. A sophisticated feel, but still fun enough for the holiday. 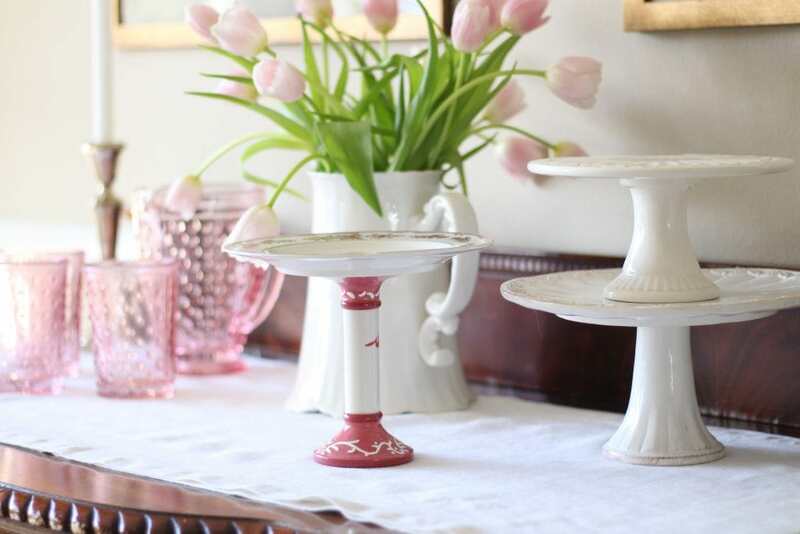 The little white pitcher is reproduction ironstone from Pottery Barn – I just love it! 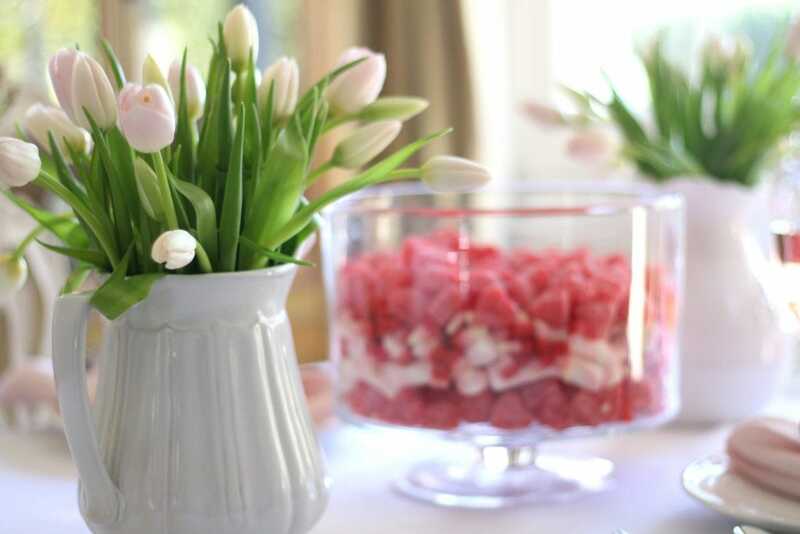 The centerpiece is simply a trifle bowl filled with various red and pink Valentine candies. 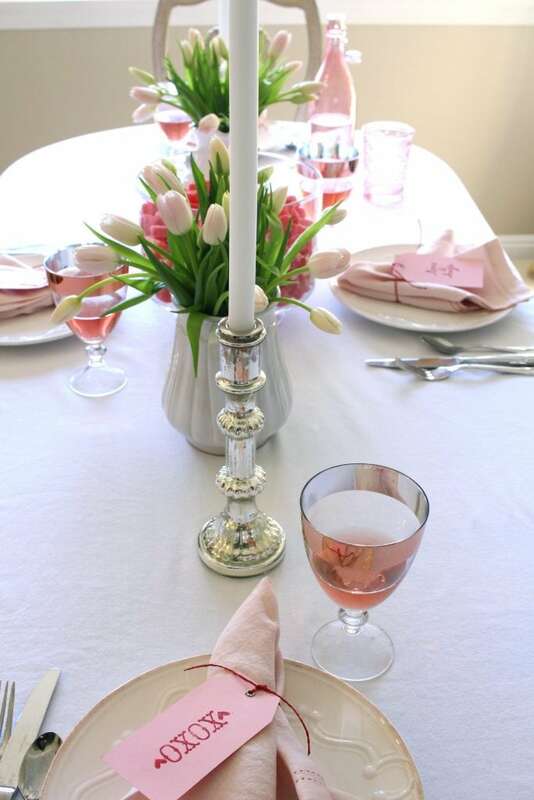 I used white plates, a simple white tablecloth and pale pink napkins. 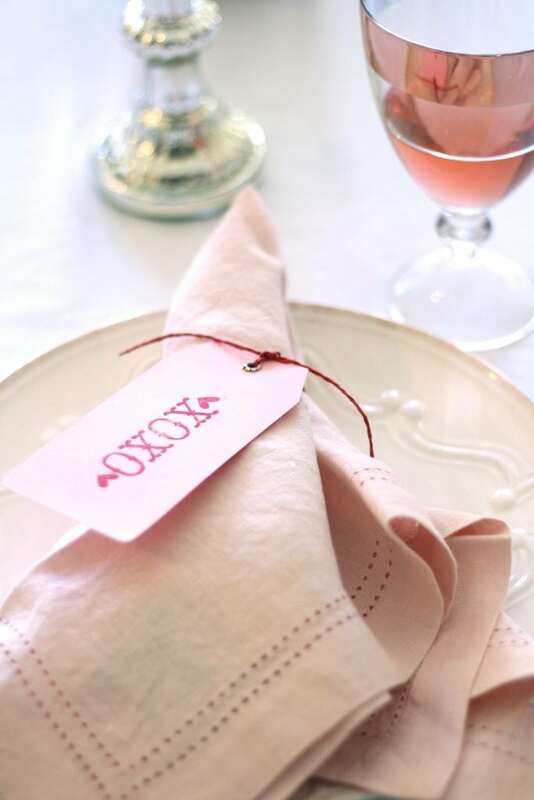 For the place cards, I wanted to keep it fun so I stamped some small pink tags with various Valentine’s sayings. I didn’t want to spend a lot, but I did hit up the dollar section at Target – score! They had such cute things for Valentine’s Day this year! 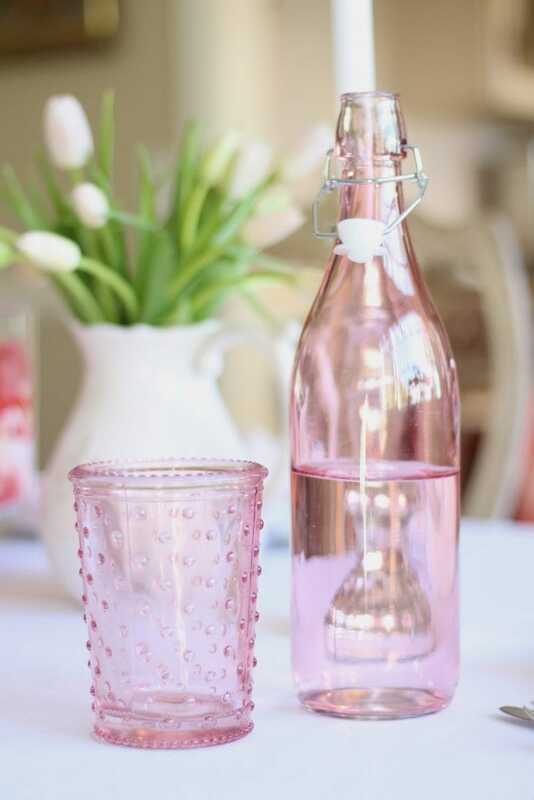 This water bottle and hobnail glasses are from there. I just love the color. One thing I love about decorating for the holidays is bringing out things you haven’t seen in awhile. This little pedestal plate is just that. I probably haven’t used it in 5 or 6 years! But it had just the right amount of pink and it looked perfect on my dessert buffet with the other white cake plates. 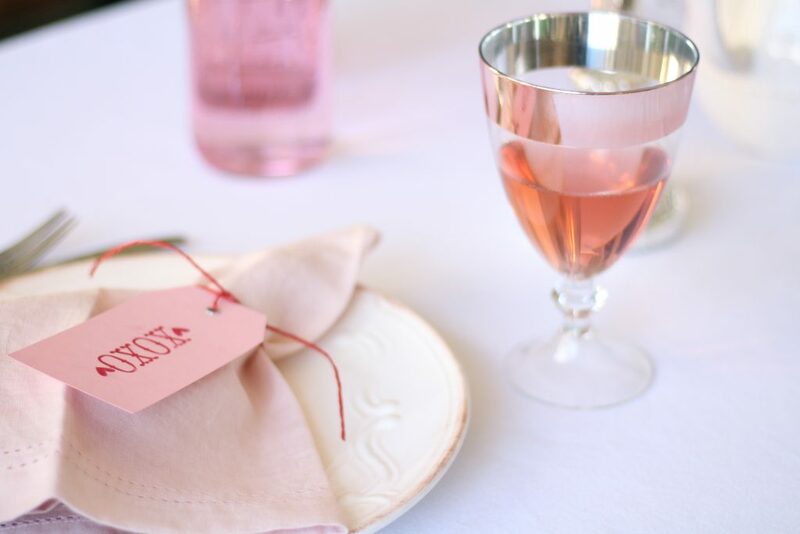 The cute wine glasses with the rose gold edge add a feminine touch. Thanks again for stopping by! See below for the other bloggers featured today, along with links to the rest of the week! 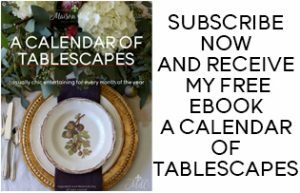 And for even more table setting inspiration, don’t forget to sign up for my emails so you can get my free e-book, A Calendar of Tablescapes! Thanks so much sweet friend! And I agree -staying in is a much better bet! Hope you’re well – and Happy Weekend! Thank you so much for your sweet compliment! Those tags were so easy to make, and I love the homemade look that you get with stamping. Sheila such a beautiful table! Those pink glasses are my favorite detail! I wish we had a Target here! Sheila this is all so pretty! I can’t believe those little glasses are from Target, I go right by one on my way to pick up my daughter at school and will have to stop in today! We rarely go out on V-Day either but I like to put a little effort into our regular weeknight dinner and make the table festive. Thank you for sharing yours!! And yes, check your Target! They were in the Dollar Spot at the front! 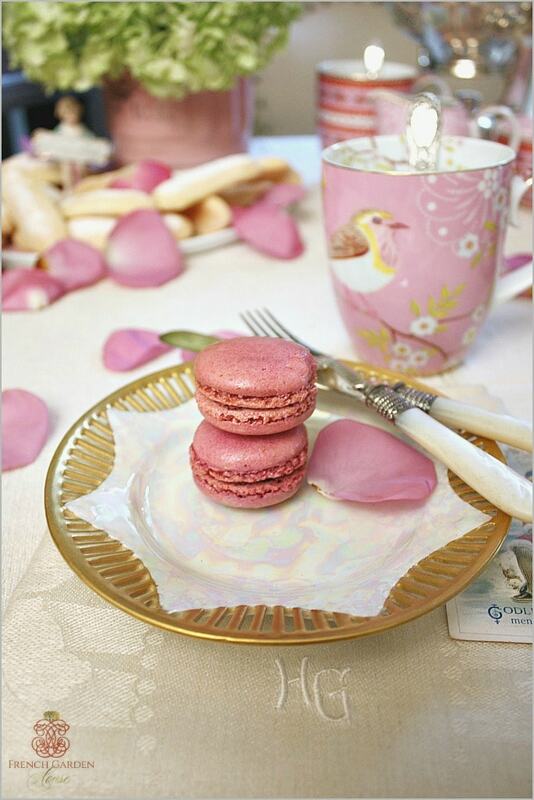 Sheila, I’m absolutely smitten with the soft pinks on your table! From the lovely tulips to every detailed piece, it all works perfectly. I’m loving the hobnail glasses, the ironstone, the napkins and tags, and really everything that’s there. What a wonderful setting for a romantic dinner!! Thank you so much Lory! I truly appreciate your kindness. AND I so appreciate you including me in the hop. This is such a talented group of women, I am truly honored to be a part of it! Can’t wait to see yours tomorrow! 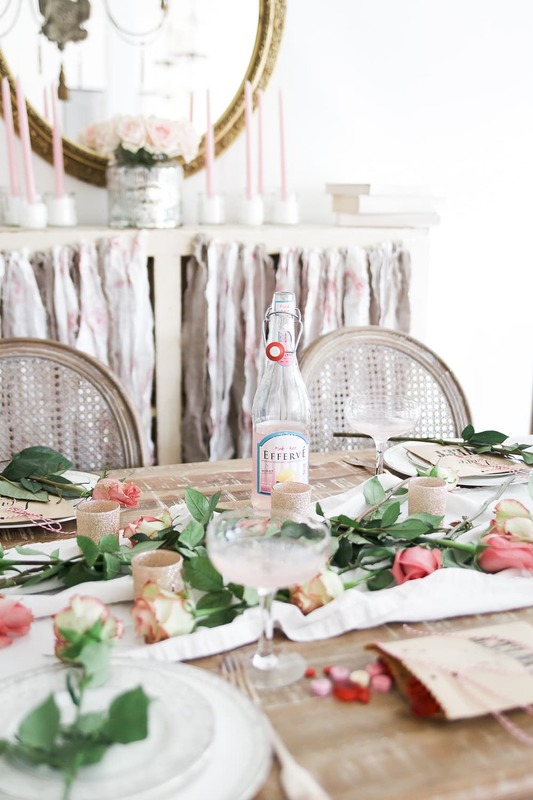 I love the serene and fresh look of your table. I am crushing over that pink glass from Target. Thanks so much Janet! I am so glad that you stopped by and took the time to leave a comment. And the “glasses” are really candleholders! Unbeknownst to me until I took off the tags – but I’m using them anyway! 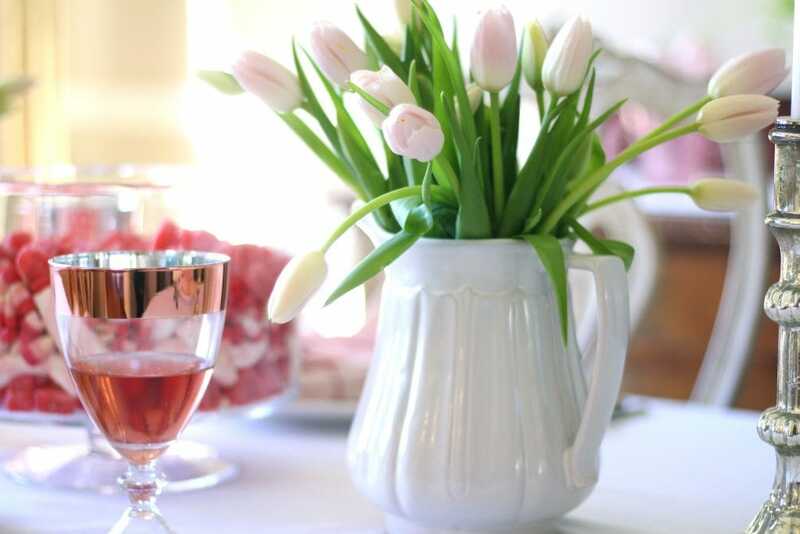 Sheila, your little white pitcher is adorable and the pale pink tulips were a great find! Thank you so much Jennifer! I fell in love with those tulips! I actually had to call several Trader Joe’s to find more! Sheila! This is all so gorgeous and perfect! Love it so much!??? Sheila I love the pink glass and those sweet baby tulips! Happy Valentine’s Day! Thank you so much! I’m so glad to be doing this tour with you – Happy Valentine’s Day! I love all the pink, Sheila! Such a pretty table and how nice that the sun was shining beautifully for you! Yes! Sun! I kinda forgot what it looked like:) Though in between the sun yesterday, it was hailing! How crazy is that?! Thanks for stopping by and for the sweet words. You’re the best! 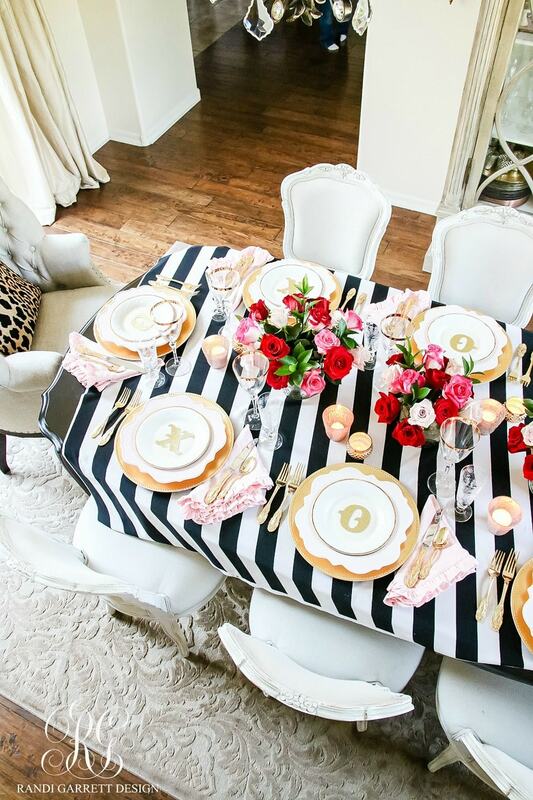 Sheila, your table is so beautiful, just right for a little dinner party! 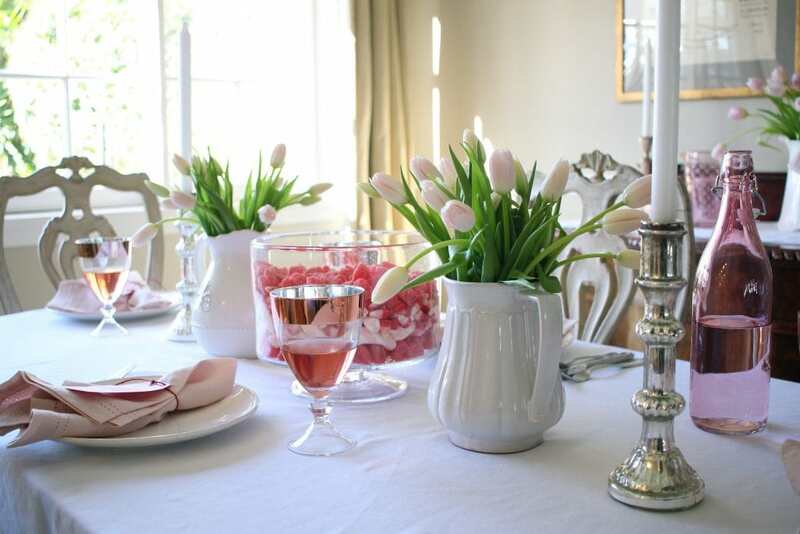 The soft colors with the white makes for a romantic tablesetting. I am thrilled to be on this tour with you. Thank you so much! I am so happy to have “met” you through this tour. I love your store and have been a fan for quite awhile. Looking forward to reading your blog now too!